This article describes the myriad ways that a scooter can be transported from point A to point B, independent of simply riding it. Of course, if at all possible, riding it would be preferable. This is probably the most common method transporting a scooter, and is vastly preferred by nearly everyone who regularly transports scooters. 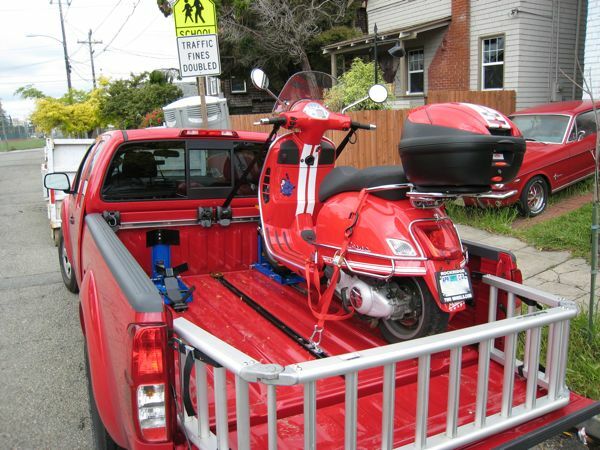 To transport a scooter in a pickup truck, you'll need a ramp suitable for getting the scooter in and out of the bed, and tie downs to secure the scooter. Additionally, a wheel chock is desirable, but not strictly necessary. Because pickup truck beds tend to be high, you'll probably need an assistant to help you load the scooter into the truck. 1) If you can, park the truck at the bottom of a hill, facing away from the hill. It doesn't need to be a big hill, even a curb will help. This lessens the angle of attack into the pickup truck bed and makes loading easier. 2) Before loading the scooter, attach the front tie-downs to the front corners of the pickup truck bed. This will give you a head start once you've got the scooter in the bed. 3) Place the ramp securely on the open tailgate of the pickup. It's important that the ramp be secure, as slipping while the scooter is on the ramp could injure you and damage the scooter. 4) With the engine off, push the scooter up the ramp. Do not attempt to ride the scooter up the ramp, unless the ramp is (a) attached firmly to the truck, and (b) wide enough to put your foot down. You will be seriously injured if you try to ride the scooter into the pickup truck bed. 5) With your assistant holding the scooter, attach the front tie-down straps to the handgrips of the scooter. Tighten the straps until the front suspension is approximately half way compressed. 6) Optionally, attach the rear tie down straps. Note that on most Vespas, this has a tendency to rub the paint unless the straps are anchored to the truck with a sufficiently wide stance. I’ve found that a wheel rail is an unnecesary expence. But a ramp is most helpful. I can usually find a grade or curb to backinto and not have to use the ramp. You need a 6' long trailer to fit a 250 or 300. The problem with the little cheaper trailers is that they have 8 inch wheels. Harbor Frieght (HF) and similar trailers are very light duty compared to Sport Utility Trailers (SUT). The cheap bearings that they put on those trailers will heat up and can cause wheel problems on anything but a short trip. You want 12 inch or larger wheels if you buy a trailer. Sport Utility Trailers are shipped in pieces, but the bed is welded sections making it less flexible and sturdier than Red Tralers or HF. I have a fold up version SUT. 745TC. The wheel chock needs to be mounted forward of the bed to create sufficient tongue weight hauling a GT, GTV, GTS, and GT60. It is best suited to a single scooter in those sizes. Kendon makes a great trialer but at significantly higher cost. Pictured with optional floor supports. Silver Streak adapted a Harbor Frieght chock. Hitch-mounted haulers (e.g. 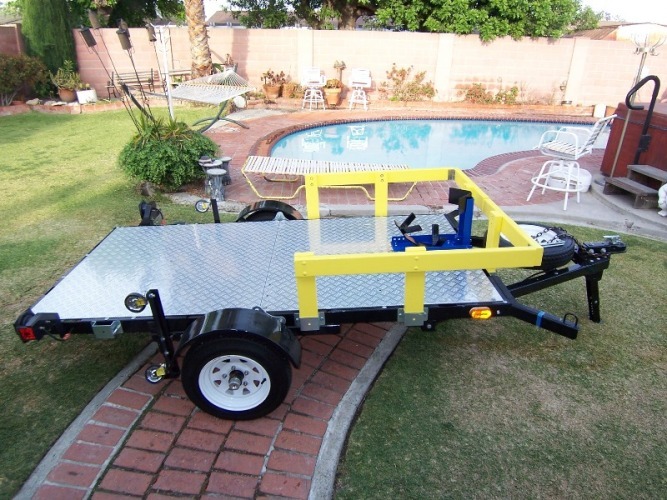 VersaHauler, JoeHauler, or Tilt-A-Rack) are essentially a narrow platform mounted on an extension to a standard Class III (or better) hitch receiver. Note that you must have a Class III hitch in order to use one of these types of haulers. Class III hitch receivers are typically only found on trucks with body-on-frame construction, such as mid- and full-size pickups. Many modern SUVs are unibody construction and lack the ability to support one of these types of haulers. A Class III hitch can generally handle a tongue weight (that's the downward force exerted on the hitch) of around 500 pounds. Check with your vehicle owner's manual for specifics. 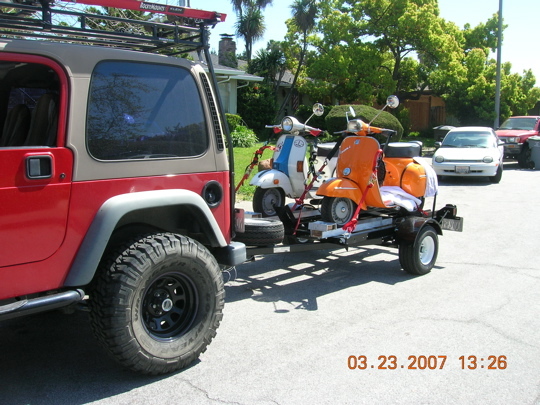 Motorcycle and scooter haulers can generally handle between 300 and 400 pounds of weight, which should be enough for any modern Vespa and even some smaller motorcycles. For hitch-mounted carriers, total weight of the scooter and the carrier cannot exceed the rated tongue weight of your vehicle/receiver. This also applies to trailer tongue weight. It MUST not exceed vehicle manufacturers spcifications. Remember, you must have sufficient tongue weight to properly seat the trailer reciever on the tow ball securely. Trailer tongue must not bounce and bang under tow. It's important to verify the specifications for your year and model car, truck or SUV.